The problem of urban pollution and acid precipitation (often called acid rain) is of increasing concern in the Washington metropolitan area. Pure, distilled water has a neutral pH of 7. Normal, unpolluted rain is slightly acid, with a pH of 5.6, because the carbon dioxide in air combines with water to form small amounts of a weak acid called carbonic acid. Rainfall in the Washington area has an average pH of 4.2 to 4.4, more than 10 times as acid as unpolluted rain. The main source of pollution here is exhaust from automobiles, trucks, and other forms of transportation. Vehicle exhaust contains nitrogen oxides and sulfur dioxide, which combine with water to form strong acids. Limestone and marble, the stones that form many of the buildings and monuments in Washington, are especially vulnerable to acid precipitation because they are predominantly made of the mineral calcite (calcium carbonate), which dissolves easily in acid. Many exposed areas on buildings and statues show roughened surfaces and loss of detail in carvings. In other areas, the calcite in the stone may react with sulfur dioxide and moisture in the air to form the mineral gypsum (hydrated calcium sulfate). The gypsum crystals grow into a network of thin blades that traps particles of dirt, resulting in a dark crust on the surface. This gypsum crust dissolves in water, so it accumulates only in sheltered areas protected from rainfall. 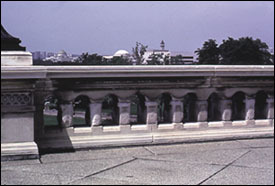 The marble balustrade on the west side of the Capitol building shows damage from acid rain dissolving the mineral calcite. Questions still remain about acid rain and building stone in the Washington area. Weathering (deterioration caused by exposure to the environment) is a natural part of the normal geologic cycle. For example, the process of weathering has turned the hard rocks of the Piedmont Plateau into the soft sediments washed downriver to form the Coastal Plain. Similar weathering processes affect the stones in buildings and monuments. Has this normal process been accelerated by human actions and urban pollution? Geologists at the U.S. Geological Survey are working with scientists at other Federal agencies, including the National Park Service, to learn more about the connections between acid rain and the deterioration of our buildings and monuments through laboratory experiments and studies of the building stones themselves. In order to protect our historically and culturally significant buildings, we need to understand how the various processes of weathering and deterioration can affect the stones from which they were built.